Sadie had no idea how an elf, a centaur, gnomes, faeries, witches, ghosts, and a dozen other magical creatures turned up on her thirteenth birthday, which happened to be on Halloween. With her dead and gone three years ago, Sadie felt like she couldn't fit in the normal human world no matter how much she tried. She tolerated the teasing and taunting of school kids and was passed from one foster family to another. On her thirteenth birthday, however, Sadie learns that she's a witch, a witchling to be exact. Before she could find out more about herself and her dead witch mother, Sadie finds herself running and hiding from Syndicate, a secret group meant to destroy all magical creatures. Much to Sadie's surprise, she finds out that she has assume a more responsible role in defeating the Syndicate, since she is the Keeper of the Ataraxia Heart. Thank you very much, Journal Stone, for sending me an e-copy of the book for review. 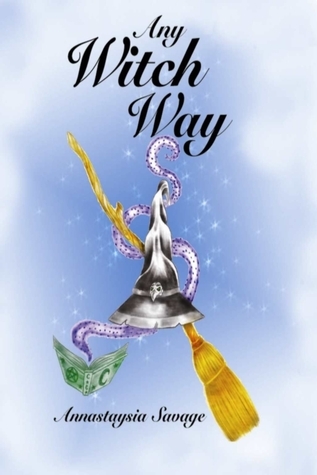 Any Witch Way is an inspiring story of a thirteenth-old girl. I really liked the characters, especially the gnomes and the troll, Alroy. I'm expecting a sequel of this book soon. After reading seven Harry Potter books I didn't want to touch any witch/wizard book. But I found this book really interesting and I wouldn't be surprised if it turns into a movie. This book will be officially released on Friday, April 8, 2011. So, make sure you grab your copy! this one does sound good! I do the same thing after reading a great book/series-- I avoid similar themed books for awhile. I'm going to add it to my list of books to check out.